With winter in full swing and less than 30 days until Valentine’s Day, cozying up to a special someone is starting to sound pretty good. Such dreams of future love or memories of loves past can prove to be powerful and inspiring. 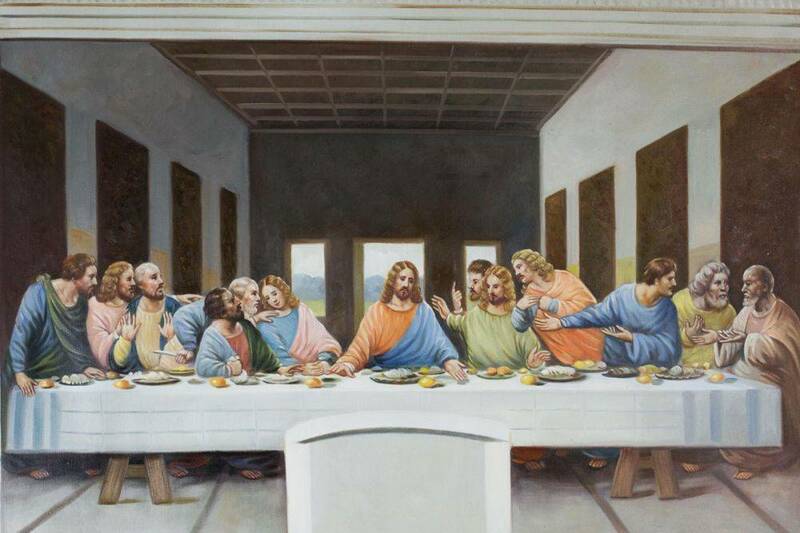 Many of history’s greatest artists have been similarly smitten and – thankfully for art lovers – channeled their emotions into timeless masterpieces. 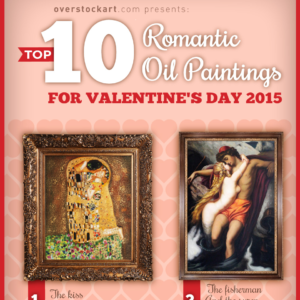 Scroll onward and discover our top 10 most popular romantic artworks! Click the image to enlarge and explore this year’s list! Klimt – The Kiss: One of the artist’s most memorable works from his critically acclaimed “Golden Phase,” it was immediately sold upon its production in 1908-1909. Compared to some of his work that preceded it, the painting received much praise for its modest yet intensely emotive portrayal of love. Leighton – The Fisherman and the Syren: This painting showcases the sensual and seductive power of the female form in startling detail. Taking inspiration from a poem by Goethe, it’s dynamic and dangerous – fleeting and fun. 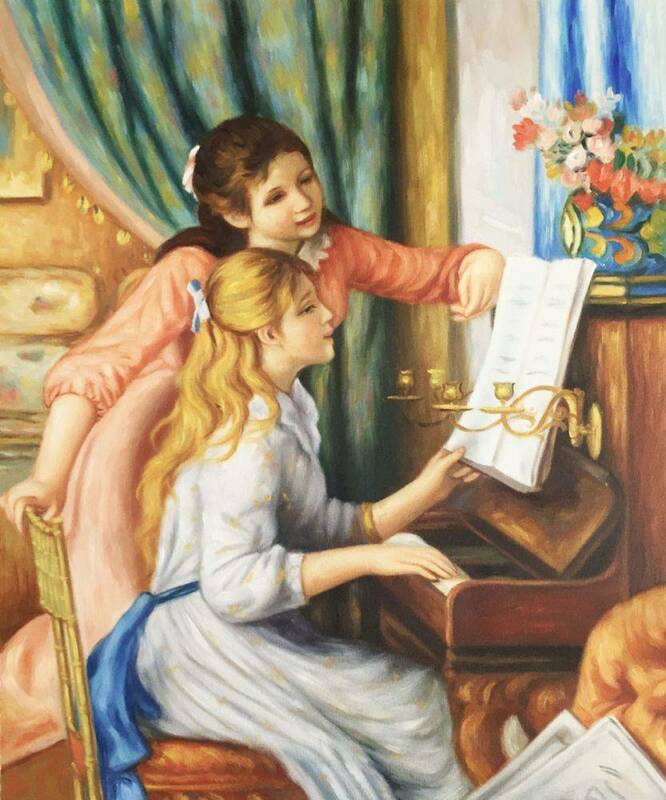 Renoir – Dance in the City: Renoir liked to paint scenes of dancing and merriment. This image in particular harks back to an era of of delicate courtship and elegant soirées. 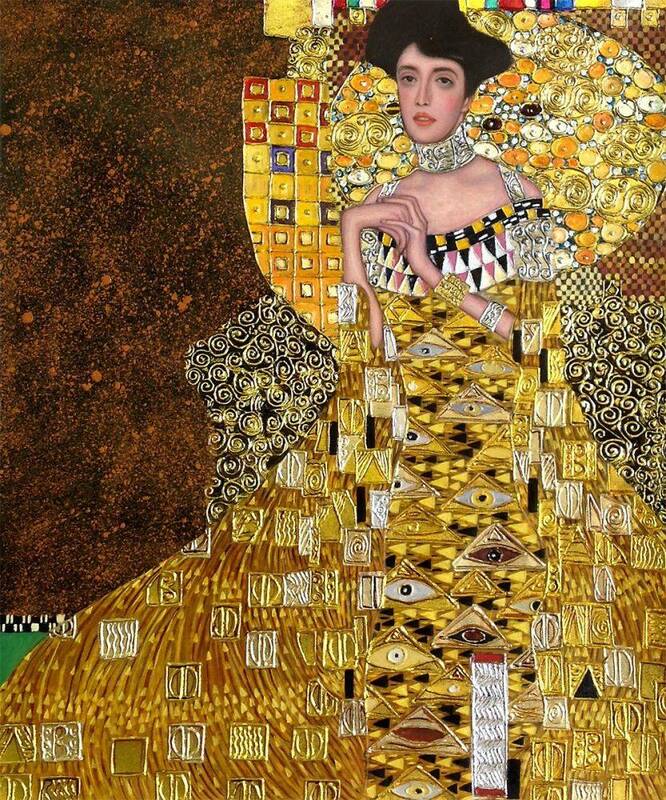 Klimt – Love (Luxury Line): The renowned Austrian symbolist makes a second appearance on the list, this time with a uniquely framed composition. The gold leaf really sets off the couple’s swooning embrace. Botticelli – Birth of Venus: One of the most well-known works in art history, “Birth of Venus” is based on Ovid’s Metamorphoses. Between the idealized form of the goddess herself and the love-themed iconography, this is one romantic painting. Botticelli is literally depicting the birth of love personified. 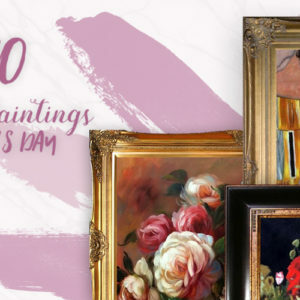 Renoir – Roses in a Vase: The French Impressionist joins Klimt as the only other artist to appear more than once on this year’s list. While not depicting a love scene per se, the fleeting, fragile, and natural beauty of this floral arrangement is a perfect symbol for romance. Van Gogh – Branches of an Almond Tree in Blossom (pink): Reinterpreted in pink, Van Gogh made this work to be hung above the marital bed of his brother Theo and his wife. Made in commemoration of the birth of a young nephew, Vincent Willem, it captures the earliest blossoms of spring in the south of France. Bouguereau – The Abduction of Psyche: Bouguereau, known for his silky smooth and classically plump mythological figures, made this sensual image in 1895. Psyche, a woman so beautiful she garnered both human worshipers and divine rage, can be seen as she’s swept away by Eros (also known as Cupid). The son of Aphrodite and god of loving desire had been sent to inflict a punishment upon her but fell so intensely in love that he claimed her for his own. Waterhouse – Windflowers: Loosely inspired by the spiritual and creative essence of medieval and classical cultures, Pre-Raphaelite painters like John William Waterhouse gave us some incredibly gorgeous imagery. Balancing idealism and imagination with a rich attention to detail gives images like this an intensely attractive aesthetic. 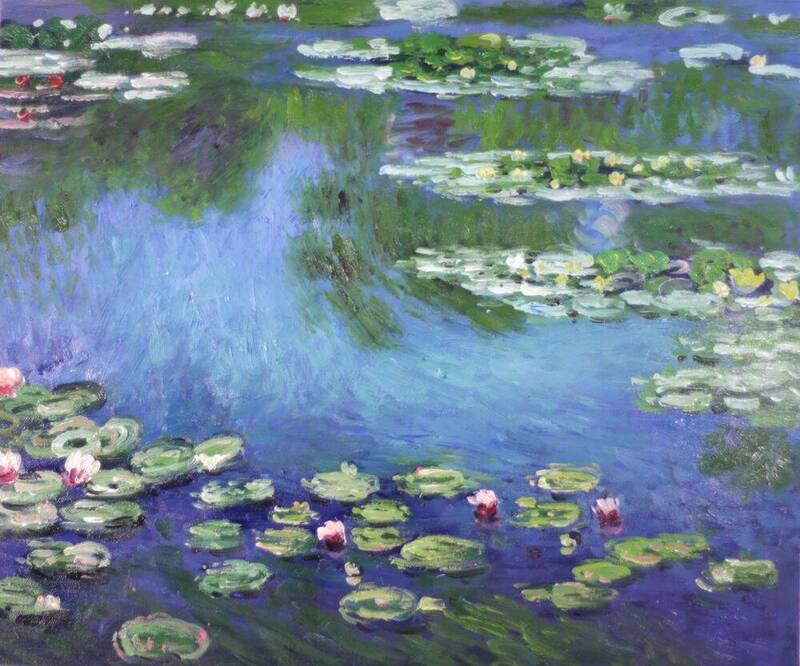 Monet – The Japanese Bridge (detail): Monet’s first wife died tragically young and left him distraught for some time. Eventually however, he would establish a relationship with one Alice Hoschedé, with whom he would settle in rural Giverny. The couple and their children made their home there, almost literally. The beautiful scenes of his watery garden couldn’t have been made without his great efforts to transform rejected swamp land into a natural wonderland. Making beauty from a bad situation and rediscovering affection later in life make this image a symbol of real love. 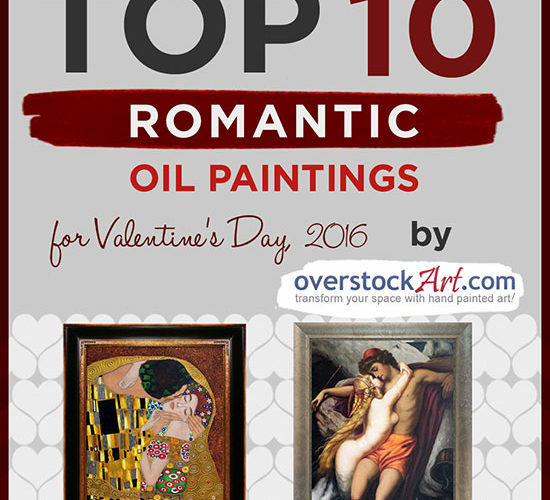 Through their millions of clicks over the past year, visitors to overstockArt.com’s Romantic Art Gallery helped create this list. “The Kiss” remained visitors’ favorite, far beyond even Leighton’s second place entry. 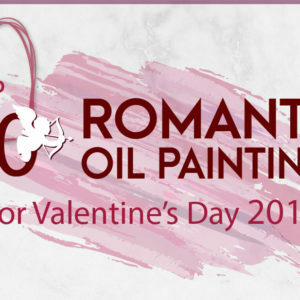 Click here to download the infograph for the Top 10 Most Romantic Oil Paintings for Valentine’s Day 2016!